Sometimes you stumble across an artist who has only a couple of comic based pieces, other times there can be just one work so brilliant, you'd risk being stoned to death by fellow art lovers for putting something else beside it. These are Random Works of Wow and illustrating the point this week is Wonder Woman by Jeff Pitarelli. Jeff calls himself 'the illustrator of the unreal" and unreal is exactly the word. 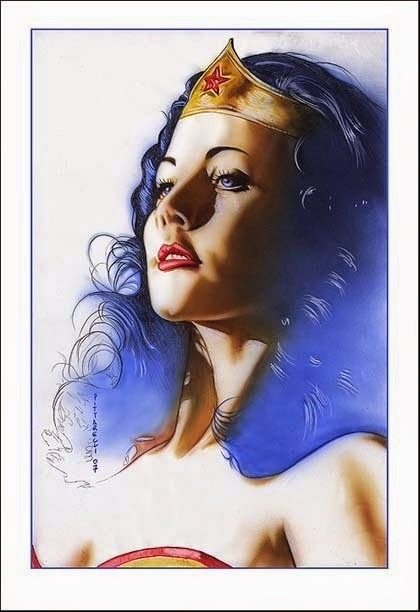 While this piece has a Lynda Carter feel, there is enough of Jeff's own style to make this more than just a tribute, but its own work altogether. It almost seems that the chestplate at the bottom was a secondary thought, and the work started off as 'naked Diana with a tiara and blue hair'. Either way, I'm not complaining. Visit Jeff's online gallery to see more of his work! This is a really special piece of work he's done. When the vast majority of non-comic fans hear WW, they all instantly think of Lynda Carter, tho there is much more to the lady herself than Ms .Carter. Having said this, she does provide a 'real-world' likeness to the character which is needed to make people identify with her, much the same way Christoffer Reeve made us believe in Superman as a real figure. Thanks Karl - glad you liked it too - really dig that hair effect!